Getting ready for the winter season? We've got you covered! Here are some great winter fashion ideas that you could try this year. We can't believe 2016 is finally here! 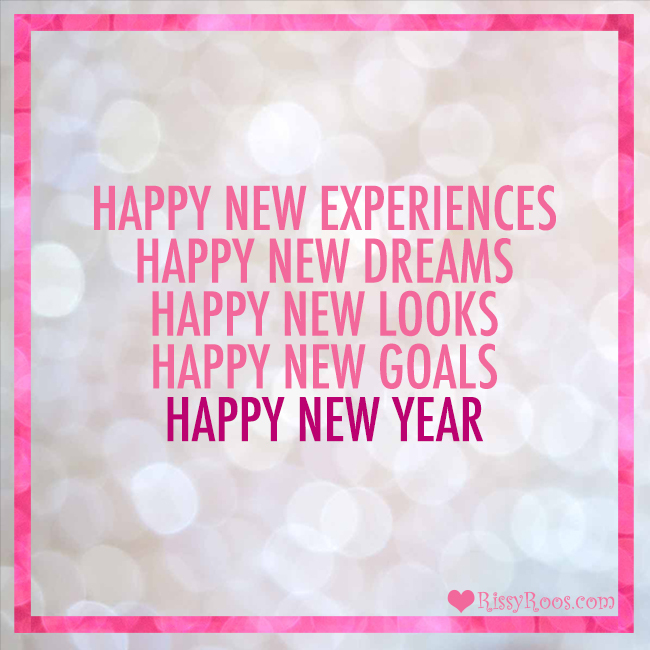 We hope everyone had an incredible 2015, and is as excited as we are for the new year and what's to come. If you've made a New Year's Resolution, stick to it! And, if you're not one for making new year's resolutions, just be excited for lots of new experiences, new dreams, new fashion looks, and creating new goals in the New Year. This entry was posted in For Fun, Winter and tagged New Year's Eve, New Years, winter, New Year, NYE, fun, New Years Resolution on December 31, 2015 by Chrissy Roos. The leaves are falling and the cold is setting in. It's definitely officially sweater weather, and while we're a little sad to see dress season go, we're excited to get all snuggled up in comfy sweaters! Plus, you can always wear dresses for Holiday parties and NYE, anyway! If you're as excited as we are for sweater season, you've probably already been shopping online just a little obsessively looking for that perfect new top. Well, we're here to help out! Check out our pick for the five cutest sweaters under $100 for Fall and Winter 2015. Tribal print is an on-trend style right now, and we couldn't love it more in this Aztec Print Cardigan. It's an oversized cardigan that will sure to have you feeling so comfy that you won't want to ever take it off. It's a very versatile style, so you could wear it to simply run errands throughout the day, for going to work, or even to attend a casual holiday party (Thanksgiving's coming up, after all!). This sweater is $52. It's also on sale right now during our 100+ Genius Holiday Gift Ideas Sale - you can take an extra 10% off with code GENIUS through the end of today! The cut out style is super popular for dresses right now, so why not bring the trend to tops? This Cold Shoulder High Neck Sweater brings the trend perfectly into winter time. The high neck makes this sweater a super trendsetting look that is sure to turn heads. This is a great choice for a casual date, or a night out with the girls paired with skinny jeans or skirt. This sweater is only $50, plus take an extra 10% off through the end of today. You can never go wrong with animal print - it's such a chic look that will always be in style. And, with this Sequin Elbow Leopard Sweater, you get some cute sparkles added in, too! It's a leopard print knitted sweater that features sequin elbow patches. This sweater is only $42, and also on sale - you can take an extra 10% off through the end of today. Black and white is always in-style, and to get it in a pull-over makes it something you can always be both comfy and stylish in. It's a marled turtleneck poncho that has side slits with pockets, long sleeves, and a fringed bottom. This is another sweater that would be perfect for casual holiday parties, like a Thanksgiving dinner. It's $66, and is on sale - you can take an extra 10% off with code GENIUS through the end of today. 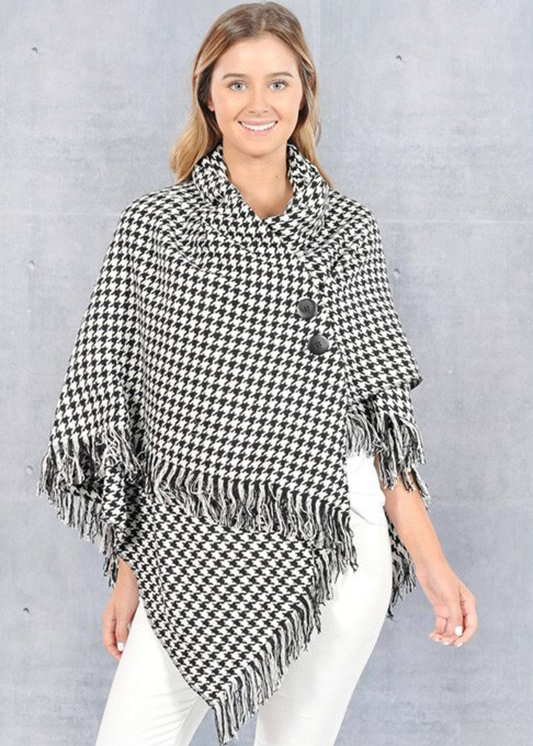 The black and white houndstooth print on this poncho gives it such a fun look. 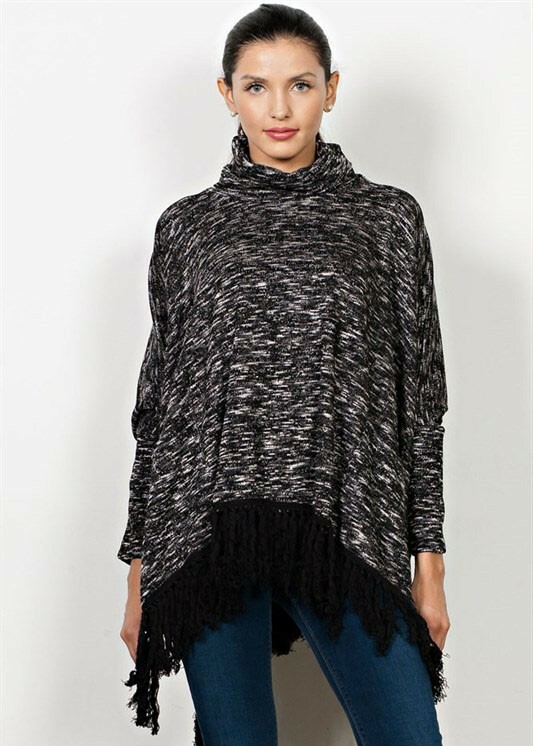 The poncho features a wrap style with large black button closures, a collared neckline, and a fringe hemline. The polyester and wool blend will keep you warm from fall into winter. It's perfect for wearing as a jacket in the warmer fall months, and as a sweater in the colder winter months. This poncho is $58. We're feeling so warm and cozy just looking at these sweaters, and we hope you do, too! They're not only great for yourself (duh), but for holiday presents for friends and family. This entry was posted in Fashion, Fall, Winter and tagged winter, fall, Thanksgiving, Holidays, Winter Fashion, Family Holiday Dinner, winter trends, Holiday Gift Guide, Fall 2015 on November 10, 2015 by Chrissy Roos.